Samsung has been pretty forthcoming with security patches for the Galaxy Note 4 recently. It released the May security patch for this handset just three weeks ago even though there are still a few devices that have yet to receive that patch. The company has now rolled out the Galaxy Note 4 June security patch in Europe. Samsung is rolling out firmware version N910FXXS1DQF3 for the unbranded Galaxy Note 4 in Europe. The firmware update has been released for the unbranded version in the Netherlands so far. It may only be a matter of time before this firmware update is released in additional markets across the region. The security patch for the month of June brings fixes for 96 vulnerabilities in Android OS as well as fixes for 23 bugs in Samsung’s software. However, this firmware update brings a bit more than just the security patch as it weighs in at over 343MB. The changelog that Samsung has provided mentions that this release brings improvements for power efficiency, memory management optimizations, performance and stability improvements. 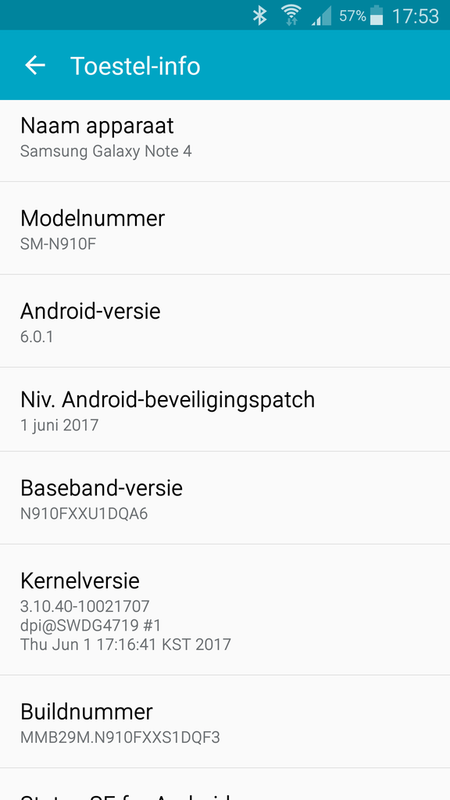 Galaxy Note 4 owners in the Netherlands should receive an over-the-air update notification soon if they haven’t already. This patch has only been released for the unbranded version of the handset so far but is likely going to land on the branded versions soon as well. Phone is getting hot, very hot after this update. In therms of normal task like using facebook, playing youtube videos…Bad. Everytime I receive these updates from samsung on my Galaxy Note 4 the battery life gets worse and drains faster than it should! Device gets hot to the touch doing basic task, or having screen on for even just a short time, samsung’s getting on my nerves. Got this on my unlocked UK Note 4 yesterday. I have to say, given how the world in general berates Samsung for being slow with updates, my experience has been great. Monthly updates come like clockwork. Now, if only they would push Nougat to the Note 4. Although, we already have some of the headline features anyway, since ages ago (PiP windowed multitasking, floating video, etc).